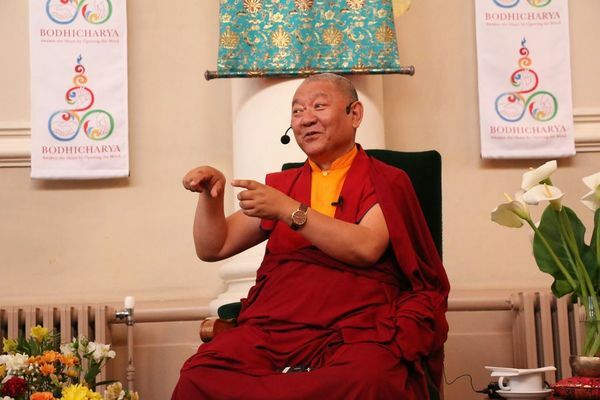 Founder of Bodhicharya, Ringu Tulku Rinpoche, translator to HH 14th Dalai Lama and HH 17th Karmapa, scholar, writer and long sought after international Meditation Master, shall be returning to Rochester in Kent to give public talks on Wednesday 1st and Thursday 2nd of May 2019! Rinpoche’s warmth, clarity, humour and skilful way with words always make public talks and teachings with him not only illuminating and deeply meaningful but also a joy to be present for. Registration will begin from 7pm, the talk from 7:15pm and the Q&A from 8:30pm. Refreshments will be available and are included in the ticket price. REFUGE CEREMONY AND BODHISATTVA VOWS – After the talk on the 2nd May, Ringu Tulku will be giving Refuge and/or Bodhisattva Vows to those who would like to make a personal commitment to their spiritual path in this way. For an explanation on Refuge please watch this video (https://www.youtube.com/watch?v=f3jgGAWTw2k). If you would like to take Refuge and/or Bodhisattva Vows or have any further questions about doing so, then please email bk.meditate@gmail.com with your full name and “Refuge/Bodhisattva Vows” in the heading, thank you. Rochester in Kent is conveniently located just off the A2 and there is ample parking next to and around the venue. To plan your journey by car, please see here (http://www.theaa.com/route-planner/index.jsp). The post code is ME1 1LS. For car parks please see here (http://en.parkopedia.co.uk/parking/rochester/). If you have any questions at all about these unique Rochester events with Ringu Tulku, then please do not hesitate to contact us at bk.meditate@gmail.com as we are very happy to help. We hope that you are able to join us for these two unique, inspiring and transformative evenings with Ringu Tulku Rinpoche.